Mike invited me to a sneak preview of 3:10 To Yuma at the Fenway Theater a few weeks ago. He wasn't that much of a fan, but I totally dug it. Check out the trailer. After the flick we walked over to El Pelon for snack time. I got a hefty carnitas burrito with refried beans, outdoor seating and hot sauce on the side for a mere $4.65. Take note: the El Pelon hot sauce is usually pretty ferocious. Mike wasn't a fan of the sauce, asserting that it traded flavor for ferocity. Let's just say we only disagreed on the movie. 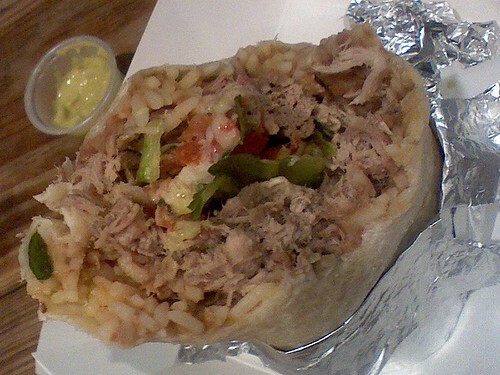 Still, this was one of the best El Pelon burritos I've tasted. This El Pelon Taqueria meal was rated: 7.4. Sunday, August 26, 2007 by Jonah.